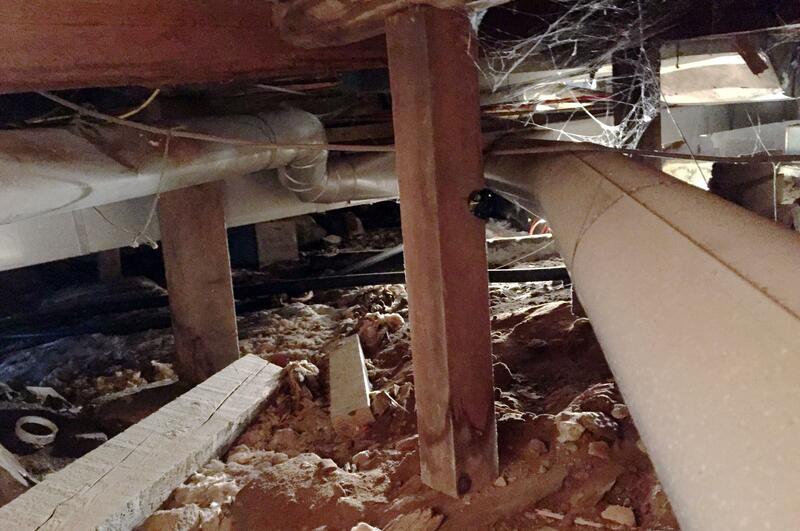 DEAR TIM: The crawl space under my 1910 home is just exposed dirt and leftover building materials. I need to add a vapor barrier and wonder about the best one. The foundation consists of granite slabs and rubble stone. It’s got small gaps in it where I see daylight. How would you go about converting this creepy place into one that’s an asset instead of a liability? Any and all tips, suggestions and warnings are welcome. –Suzanna S., South Bristol, Me. DEAR SUZANNA: I’ve been in quite a few creepy crawl spaces such as yours. It’s always an adventure. I can get a little anxious, much like the character Danny the tunnel digger in the classic movie “The Great Escape,” if the distance between the dirt and floor joists is less than 20 inches. The job you’re about to undertake will yield big rewards if you add one more facet to it. I’d add insulation to the underside of the floor as part of the scope of work, but we’ll talk about that in a little bit. If I were helping you do this job, the first thing we would do is get rid of all the old building materials and any scrap who-knows-what that’s in the grotto. Be sure to wear goggles – not mere safety glasses – while doing this. I’d also recommend that you don the best face mask you can afford to block the smallest particles of anything from getting into your lungs. People have contracted serious lung infections from inhaling bad things that get airborne as they move things around and disturb dust as they work. The second step would be to try to remove any high spots of loose dirt and do everything within reason to increase the distance between the dirt and the floor joists. It’s ideal to have about 30 inches of space, but it may be a vast undertaking to remove that much dirt. At the very least you want to get rid of any sharp rocks or anything that would puncture the vapor barrier you’ll be installing. The flatter the ground, the easier it will be to install the vapor barrier and tape the seams. After you have the dirt prepared, then it’s time to fill in all the open spaces between the granite and rubble stone. It’s going to be easier to do this from outside the structure than on your belly or back in the crawl space. However, I’d recommend you try to fill from both sides. I’d mix up a rich mixture of fine sand and hydrated lime for this job. Hydrated lime is easy to get online. I’d blend one part sand to one part lime for the inside mixture and fill the voids using a mortar bag that’s similar to what bakers use to decorate cakes. The mortar mixture needs to be very rich, smooth and wet to flow through the bag and not clog the tip. The outside mix can be two parts sand to one part hydrated lime. Just use a pointing trowel or whatever tool you can manage without smearing the mortar on the stone. It’s very important to fill all the gaps because you don’t want any rain-driven water to get on top of or under the vapor barrier. It’s now time to put in the vapor barrier. You’ve got lots of choices. Often people select the standard 6-mil clear plastic you see at the big box stores. It will work, but it’s not the best product. I’d go with a cross-laminated vapor barrier that’s often specified for commercial and institutional work. Find one that meets or exceeds the ASTM E 1745 standard. These allow very little amounts of water vapor to transfer through the membrane. Purchase a vapor barrier that has its own special tape that bonds to the plastic so all the seams are sealed. Don’t count on cheap duct tape to stand the test of time. You want to lap the vapor barrier up the foundation walls and attach it to the wood sill plate the floor joists rest on. Use long pieces of thin wood lath to secure the vapor barrier to the sill plate. You’ll have to get creative around any vertical wood posts or masonry columns. It won’t take you long to figure out how to add pieces of the vapor barrier that run up the vertical structural members and then lap down onto the flat vapor barrier that’s on the dirt. Just tape all overlaps well so no vapor can escape into the crawl space. Once the vapor barrier is in place, you can add insulation in between the floor joists. Avoid the temptation to use expanding foam. One of my website visitors had a company do this and the expanding foam detached all the ductwork from the floor joists, causing a disaster. I’d just stick with time-tested unfaced fiberglass batts. I’d put in at least 6 inches; if you can afford it, do 9 inches because of your extended harsh winters. Your feet and checkbook will appreciate it. Not only will your floor be much warmer, you’ll use less heating fuel on those frigid nights. Find Tim Carter’s past columns, plus videos and Quick Start Guides, at www.AsktheBuilder.com. Published: Sept. 9, 2017, 4 p.m.